Home/People and Sound/Investigate Marine Animals/How is sound used to identify ecological hotspots? There are many definitions of the term “ecological hotspot,” but the general concept is that marine ecological hotspots are regions of high biodiversity or locations of higher local abundance of species. However, the spatial and temporal variability within the marine environment makes traditional place-based conservation measures, such as marine protected areas, very difficult to implement. The practice of drawing a static boundary and declaring an area a hotspot involves a variety of data. The use of acoustic methods for identifying ecological hotspots has increased in recent years, as the following examples demonstrate. Scientists have worked for several years to map the coral reef ecosystem of the Caribbean. They use multibeam echosounders, underwater gliders, and remotely-operated vehicles (ROVs), in addition to other scientific equipment, in their studies. Tools NOAA scientists use to map different features of the ocean. Image courtesy of NOAA Ocean Service (http://oceanservice.noaa.gov/caribbean-mapping/seafloor-map.html). Their objective is to map the seafloor habitat in very fine detail, providing new information on the coral reefs. A NOAA Ocean Service video of how sound is used to map the seafloor can be viewed below. In addition to mapping the seafloor, scientists also want to understand how fishes use the coral reefs. Using sonar designed to detect fishes, they can locate fishes and reconstruct the ecosystem, showing the habitats most used (http://oceanservice.noaa.gov/facts/fish-sonar.html). This information helps ocean managers identify hotspots that may require additional protection. The designation of a hotspots can be based on species that are considered important for conservation (e.g., endangered or threatened existence), economic reasons (e.g., commercial fisheries), or species that are considered keystone indicators of ocean health. It is important not only to protect a specific species, but also the habitat that it occupies, and the prey on which it forages. Predator-prey interactions are quite complex, with predators congregating in areas with high prey density, while prey try to avoid or escape predators. Acoustics are being used to study and measure the fine-scale dynamics of predator-prey interactions, helping scientists understand the characteristics that may result in ecological hotspots. Studies around the Pribilof Islands in the Bering Sea used an echosounder to map the distribution and density of euphausiids and fishes, primarily juvenile walleye pollock. The prey were found to aggregate in patches. Their depth in the water column, as well as the size, height, and area of each prey patch, were measured. Relationships among these variables and the density of prey within each patch were predicted using a statistical model. Visual surveys for birds (black-legged kittiwakes and thick-billed murres) and marine mammals (northern fur seals) were conducted, and individuals were tagged with archival tags that recorded activity indicative of foraging behavior. Scientists found that the distribution of predators was most closely linked with prey density and vertical distribution in the water column. Submarine canyons can be ecological hotspots. The rugged bathymetry and unique oceanography of submarine canyons increase the amount of food, contributing to increased biodiversity. Researchers used multibeam echosounders and sidescan sonars to map Whittard Canyon in the eastern North Atlantic Ocean. They measured environmental variables and verified the acoustic maps with video transects, using an ROV to identify invertebrate species within the canyon. Models predicted the biodiversity based on the environmental variables. Vertical walls, representing less than 0.1% of the canyon’s surface, had the highest diversity of organisms. This study demonstrated the usefulness of acoustic techniques for developing high-resolution maps. 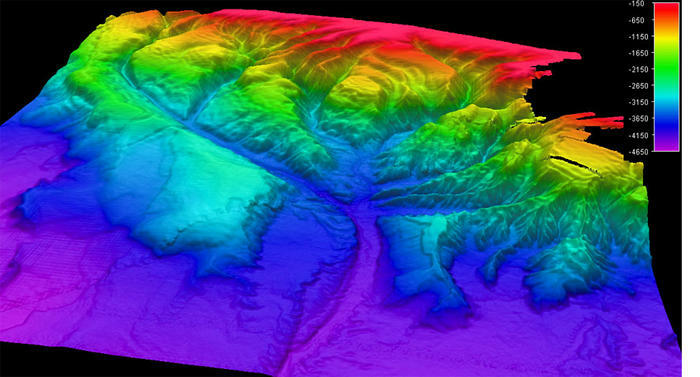 3D terrain model of Whittard Canyon (Atlantic Ocean, off southwest Ireland) derived from Irish National Seabed Survey & INFOMAR data, to direct ROV operations during a deep-sea expedition funded by Science Foundation Ireland and led by NUI Galway. A depth scale (color bar) is shown in the upper right, with shallow areas shown in red, and deeper areas in blue and purple. People and Sound, How is sound used to locate fish?